Week four was a very nice one for my fantasy surprises as Jordan Howard and Hunter Henry had big games, both Terrelle Pryor and the Texans defense found the endzone, while Trevor Siemian performed well before his injury. It’s hard to believe, but the first half of the fantasy regular season is almost over. That means it might be a decent time to start looking at potential trades. One thing to notice about players at this point is if their performance through four weeks is sustainable across the whole season. For instance, Odell Beckham was taken in the top half of the first round in almost every fantasy draft around the country. With no touchdowns through four games, some of those team managers are in complete panic mode. Beckham is still an incredible talent, so for the right price it’s worth trying to get him on your roster. On the other hand, someone like Isaiah Crowell has completely exceeded expectations so far. While he could still have well over 1,000 yards, the odds of maintaining 6.5 yards a carry are highly unlikely, so this might be his peak in terms of individual game production. If you have other running backs you can count on, or are high on one that is struggling at the moment, this could be the time to put players like Crowell who have been fantastic at this point on the trade block. QB: Carson Wentz vs Lions: The Eagles were on bye on week four, but now returning it’s once again time to board the Wentz wagon. Through four games, the Lions pass defense has been absolutely atrocious. 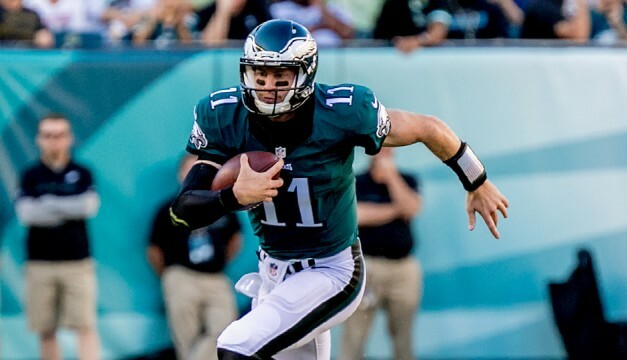 Even in a road matchup where he likely won’t be asked to throw 35 plus times, Wentz could be one of the highest scoring quarterbacks of the week. Expect around 260 yards and two touchdowns. RB: Terrance West vs Redskins: With Justin Forsett out of the picture and Kenneth Dixon getting eased back in returning from injury, West should see the vast majority of carries in the Ravens backfield. The Redskins are a defense that has been gashed by the run to this point, so West at the worst makes for a very solid 2nd running back in fantasy lineups this week. Expect around 90 total yards and a touchdown. WR: Sterling Shepard vs Packers: Considering he has been in this spot before, I would think it’s safe to say I’m a fan of Shepard’s game. The Packers might be coming off a bye week, but the issues in their secondary might not have been as simple as a one week adjustment. While this could be the game Beckham finally goes off (in order to help his team this time), Shepard should be a safe play as a third wideout in leagues this week. Expect around 60 yards and a touchdown. TE: Zach Miller vs Colts: Miller has touchdowns in back to back games now, and it wouldn’t be surprising if he made that three. The Colts defense has struggled almost all year and have shown some vulnerability to pass catching tight ends. If you need a tight end who might be available that can produce like a starter, Miller is the one for you. Expect around 60 yards and a touchdown. K: Graham Gano vs Buccaneers: The Panthers offense hasn’t been close to the juggernaut they were last season. However, this is a game that could be their slump buster. the Buccaneers defense has been reeling of late and this is a great start for the offense (and Gano’s fantasy appeal) back on track. Expect around two field goals and three extra points. DEF: Dolphins vs Titans: Considering what I wrote in my picks article earlier today, it’s safe to say I’m not completely sold on the Titans offensive scheme. For that reason, the Dolphins defense is one I like that could be available. If you are in need of a defensive streamer this week, this is certainly one that is worth consideration. Expect around three sacks, an interception and fumble recovery. This entry was posted in fantasy football, NFL, sleepers and tagged 2016 week five fantasy football predictions, 2016 week five predictions, Carson Wentz, daily fantasy football advice, fantasy football sleepers, Graham Gano, Miami Dolphins, NFL, Sterling Shepard, Terrance West, Zach Miller. Bookmark the permalink.